Painting is deceptively easy, meaning it’s not really as easy as it looks. Sure, any chimpanzee can be taught how to load a brush and slap some paint on the wall, but a quality paint job requires human intelligence and at least a temporary devotion to detail (two qualities that slumlords apparently lack entirely). For your next painting project, be sure to steer clear of these 10 amateurish painting mistakes, lest your work be compared to a slumlord’s…or a chimp’s. 1. Don’t skimp on the prep work. Like middle school, prep work is awful drudgery that must be completed before you can move on to better things. Indoors, the most important stuff is cleaning all surfaces, beautifying damage and patched areas, and prepping the area (see item 10, below). Outdoors, the critical prep work is removing peeling and otherwise loose paint, repairing damaged or rotted wood, and cleaning all surfaces. 2. Don’t mess with old paint unless you’re sure it’s lead-free. Apart from curious, if not so sensible, kids eating paint chips, all of the warnings about lead paint can be realized with paint prep work: sanding or scraping lead paint makes it friable (airborne), the perfect state for getting into your body. To play it safe, if there’s any chance a surface may have been painted prior to 1980 (lead house paint was banned in 1978, but you can still buy lead paints for specialty applications), have a sample tested first. For more information on testing and dealing with lead paint, visit the EPA’s web page. 3. Don’t paint over moisture or active mold. Stain-blocking (and specifically mold-blocking) primers are good for preventing color bleed-through from dark mold stains, but they’re not intended to correct a live mold problem. And they’ll only mask a moisture problem for a very short time. Since mold and moisture go together, first stop the moisture (wherever it’s coming from), then kill the mold (with detergent or diluted bleach), and let it all dry completely before priming and painting. 4. 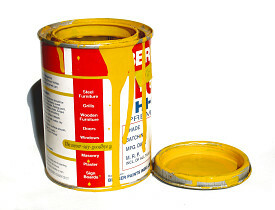 Don’t paint bare surfaces without priming first. As much as you might resent it, primer is your friend. It sticks really well, it fills pores in raw materials, and it’s less than half the price of paint. Using an extra coat of paint instead of primer is a waste of money and likely will result in a poorer finished product. 5. Don’t paint masonry on a whim. Poured concrete, brick, stone, and concrete block are among the very few building materials that can fairly be called “maintenance-free.” Painting them once changes that forever. 6. Don’t use tape (in most cases). Pros don’t use tape for the same reasons you shouldn’t: it’s time-consuming and painstaking to apply, it usually lets paint bleed underneath its edge, and it can peel the new paint off when it’s removed. Instead of using tape in the usual places, remove anything that’s removable (like outlet covers and cabinet hardware), and take the time to “cut in” a clean line of paint along the edges of trimwork and the like. 7. Don’t use cheap paint. Quality paint goes on better, lasts longer, and has much nicer color than lousy paint. And when you consider that you’ll be looking at the results for the next decade or so, ten or fifteen extra bucks a gallon is a worthwhile upgrade…unless, of course, you’re a slumlord. 8. Don’t use cheap paintbrushes. This goes right along with the last item. A $3 brush will never work well and should be discarded after the first job, right about the time it starts shedding bristles. A $10 brush knows how to handle paint and will become a treasured tool for years down the road. 10. Don’t paint over outlet and switch covers. Being too lazy to remove electrical cover plates before painting and merely taping off the covers leaves a ridge along the edge that usually peels away in a large, unsightly chunk if the cover is removed later. Take two minutes to remove the switch plate ... please!